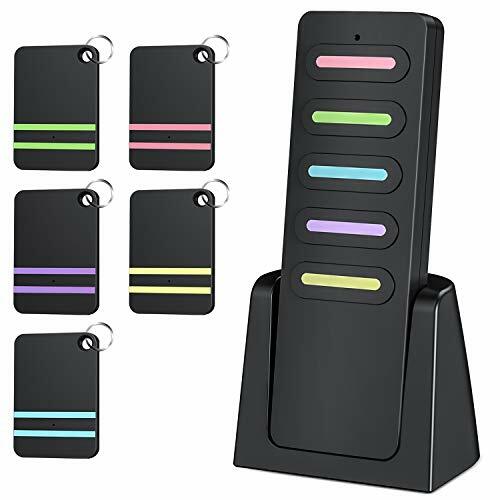 ❤:1 Transmitter and 5 Receivers：attach the receives to any 5 items and simply press the Color buttons on the transmitter to locate them. The receiver sounds/beeps will lead you to find your lost item. ❤:Powerful and long distance range: Up to 80dB beeping sound and 30m (100ft)wireless range in open area! ❤:Attach It to Anything: This locator tracker is widely used in daily life, help to find your keys, phone, wallet, pet, purse, luggage and anything you always lost. ❤:Come with double side sticker and key rings,which means you can attached it to your tv remote or attach it to your key chain with the rings that come with. The item finder will help you solve the small trouble in the work or life. ❤:Upgrade quality batteries and low consumption: batteries included, Low consumption and long standby time. Upgrade quality batteries, long lasting, not easy to run out. ❤:A great gift to forgetful person, elders friends, etc. You can also attach it to find your baby cats and dogs at home if yo want! No more hide and seek!" 5 RECEIVERS: Attach the receives to any 5 items and simply press the Color buttons on the transmitter to locate them. The receiver sounds/beeps will lead you to find your lost item and help you solve the small trouble in the work or life. SOUND & LIGHT: receiver sounds/beeps, leading you to your lost item. The remote control is equipped with a LED light for better night visibility when locating the buttons. Health Care:A great gift to forgetful person, elders friends, etc. You can also attach it to find your baby cats and dogs at home if yo want! No more hide and seek! BATTERIES LOW CONSUMPTION:Batteries included, long lasting one year, not easy to run out. Low consumption and long standby time. Upgrade quality batteries. Contact our customer service for any quality problems. If you have any questions about this product by EALNK, contact us by completing and submitting the form below. If you are looking for a specif part number, please include it with your message.